Preston Miller (Integrity Auto Service): Here at Integrity, we’re very selective about the vehicles that we choose to sell. We don’t want to carry vehicles that have a bad service track record, maybe have inherent problems that are going to cause you issues down the road. I don’t buy vehicles that have signs of any serious accidents, that have hail damage, that smell like they’ve had flood damage. On top of that, every vehicle we sell will come with a free AutoCheck report, so you know the history of the vehicle just like I do when I’m buying it. Whether you need a half-ton two-wheel drive truck, maybe you need a four-wheel drive crew cab, maybe you need a 3/4-ton truck or a flatbed to haul a diesel tank or trailer,… we’ve got just a little bit of everything here at Integrity Auto Finance. We have the best selection of Buy Here Pay Here trucks in Oklahoma. Ralph: Well the reason for me why trucks are so important: that’s what I do for a living — I do oilfield hotshot. We use the trucks for everything that we do. They offer a great selection. For a long time I was a Ford guy, and when I came in, Preston kind of talked me into a Chevy, so I let it slide a little bit! I came back with 350,000 miles on the Chevy. Now I’ve got a Dodge. I told him the work kind of changed just a little bit, so I need a beefier truck. He’s looking for a couple of 3/4-tons for me. He asks me exactly what I need — flatbed, long bed, short bed — if he doesn’t have it, he always works with me to get what I need. So the selection is always great. And, like I said, as far as the upkeep on the trucks, I average 200,000 miles after the first year-and-a-half, easy! That’s something you do on a new truck; these are used trucks! And I’m putting 200,000-300,000 miles on them! 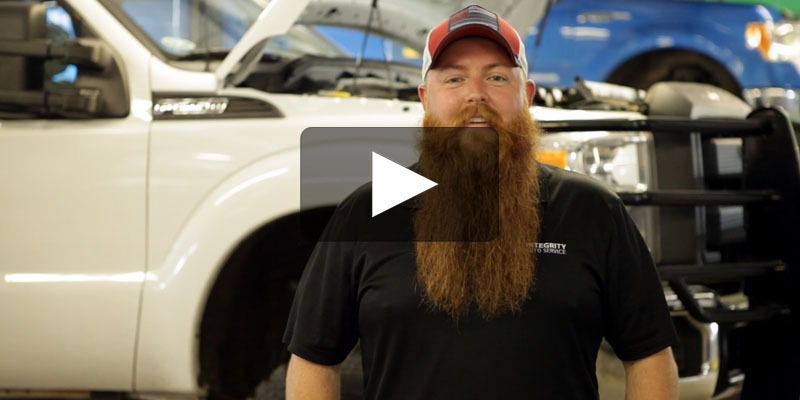 Bob McCaslin (Integrity Auto Service – Recon Shop Foreman): Keep up with your preventative maintenance and your oil changes, so that way you don’t end up accidentally voiding any factory warranty your vehicle may still have on it or your Heartland Service Plan here with us at Integrity. By preventative maintenance, we mean items such as your oil change, making sure your air filter is changed on your vehicle, changing out coolant or transmission fluid whenever the vehicle manufacturer recommends to have that done. There’s numerous different components to the vehicle that have to be serviced regularly. When you bring your vehicle to us for an oil change, we have a comprehensive inspection that we perform every single time, checking all your fluids to make sure that they’re the proper level and in good condition. Narrator: Other Buy Here Pay Here dealers boast about their “lifetime bumper-to-bumper” warranties, which contain so many gotcha! clauses that they amount to no real warranty at all. At Integrity, our Heartland Service Plan is approved and licensed by the State of Oklahoma Insurance Department, giving you something you can believe in. Preston Miller (Integrity Auto Service): Now that’s Integrity!